bright.green.home We're on a quest to live greener and smarter. 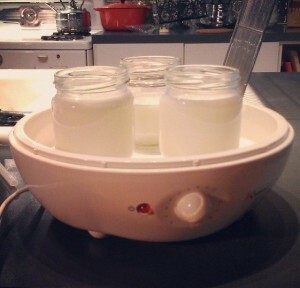 Though not officially planned for Earth Day, I’ve learned how to make yogurt with some good timing. Not only will it stop me from buying more plastic, the taste speaks for itself. The electric blanket.. The crock pot… The oven… Or some variation. But that’s just too much for me. I couldn’t do it. I decided to go with the gadget. I will beg Alton Brown‘s forgiveness later (he, btw, goes the electric blanket route). With the yogurt maker, you follow the manufacturer’s instructions – though it seems that most instructions are quite similar. 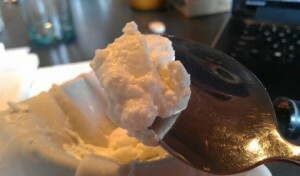 For mine, I had to heat up the specified amount of milk to 180 degrees in a pot. Translated for the busy mom: a kid started screaming once I put it on the stove and I forgot about it briefly and caught the milk as it started boiling. Since I couldn’t find my thermometer to be sure what the temp was and it was bedtime, I took it off the stove to cool to the suggested 110 degrees, but by the time I got back to the milk, it was room temp or something like it. I kept moving forward thinking If this is that precise of a science, it will never work for me anyway. Then I put the dome on it, set the timer for 8 hours and went to sleep.